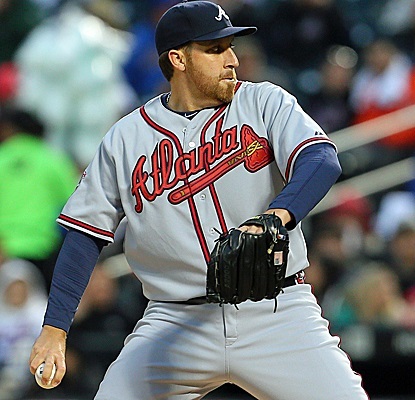 Friday night, Atlanta Braves starting pitcher Aaron Harang had pitched 7 innings and not given up a hit. The Braves removed him from the game, taking away his chance at a no-hitter. Their reasoning was understandable, but I’m here to tell you why they were wrong. First, let’s take a look at the situation and see it from management’s point of view. We’re still early in the season, and the Braves have hopes of a championship run. Those hopes have been hurt somewhat because before the season started, their pitching staff, which was supposed to rely on a bevy of talented young arms, started exploding. Almost literally. In less than two weeks, Brandon Beachy and Kris Medlen blew out their elbows in a manner requiring surgery, definitely missing the season, and having no guarantees they’ll be able to regain their abilities. Later, staff ace Mike Minor developed tendinitis in his pitching shoulder and hasn’t pitched for the team yet this season. It was those issues that led the Braves to sign the likes of Aaron Harang and Ervin Santana, just so they’d have the ability to actually field a team. 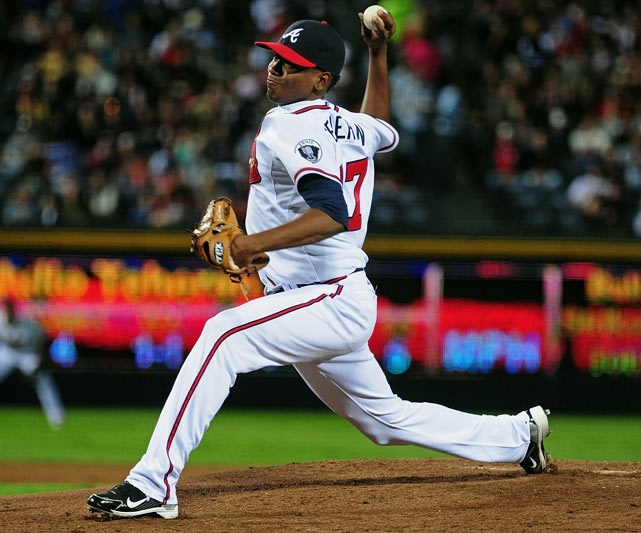 It’s also led me to want to put Julio Teheran in a glass case, like you’d use to hold a fragile collectible. I just want your arm to be safe, Julio. Santana was expected to be a solid pitcher, and teams just hesitated to sign him because of his cost. Harang, on the other hand, is a guy. He had a few good seasons with Cincinnati, but those were about a decade ago. Harang is about to turn 36, which is an age when baseball executives start looking at a player and fondly remembering the end of Old Yeller. He also doesn’t have a recent track record of success that would lead a team to give him a chance. He’s been bad. But the Braves had a closetful of broken pitchers they had been counting on, and Harang was out there, just hanging out, so he got the call. And he’s been great so far. Because if you ever think you have baseball figured out, the personification of the game will just laugh at you and have Mark Lemke hit 37 triples in a World Series. This is likely not a sustainable greatness, and not just because of his recent seasons. Harang doesn’t have the repertoire of a successful pitcher. He doesn’t overpower hitters (he throws mostly in the 80s), and he doesn’t bewilder hitters (the differentiation between his pitches is mostly academic). He just annoys hitters, biffing and doinking his way through innings. He’s succeeding because when batters hit his pitches, you don’t hear a crack of the bat, as has been immortalized in song and poem. Instead, the bat hitting the ball sounds like a wet fart when it comes from Harang. Just pffffbllllaaart, all game long. That can’t last. Pitchers don’t succeed by grossing out hitters. Eventually, they hold their noses and beat the crap out of the ball, and Harang doesn’t get to pitch anymore. But for now, he’s helping the Braves, and he’s been the most successful pitcher in the league so far. And in this game, as the seventh inning ended, Harang was six outs away from completing a no hitter. But he had also thrown 126 pitches, which is when managers start imagining arms falling off, because Old Hoss Rodbourne isn’t in the game anymore. Manager Fredi Gonzalez, while calling it an extremely tough decision to remove Harang, mentioned he wants the pitcher to make 25 more starts for the team this year. So preservation of his arm was clearly a factor. He’d also been struggling in his last couple of innings, walking two each in the sixth and seventh. It was also only a 1-0 game at that point, so the Braves didn’t want to risk things getting out of hand and losing the game. Despite all the injuries, Atlanta is in first place. Losing a game would be tough. At this point in his career, we pretty much have the tale of Aaron Harang. It’s the story of a moderately successful pitcher. He won’t be remembered much once he leaves the game. He might a get a couple of token votes his first time on the Hall of Fame ballot, but not enough to stay on for another try. This was his chance at immortality. Behold the doofy image of your new god. Oh, what could have been. There have been over 200 no-hitters pitched in Major League Baseball history, at about a rate of 3 per year, though it varies widely. They are always widely celebrated, and that’s the story you tell everyone forever, and it always gets respect. In 2001, A.J. Burnett threw a no-hitter while walking nine batters, and you know what? Those walks didn’t matter. He threw a no-hitter. This was an amazing chance for Harang, and it was taken away. As for preserving his arm, again, Harang just doofs his pitches up there now anyway. His fastball is in the 80s, and his changeup and curveball also reliably go in the general direction of home plate. He could be pitching on a blow-out arm right now and nobody would really know. There’s just no way this continues for the entire season. Harang has been getting excellent results, but it’s extremely unlikely to last (I only don’t say “definitely” because, again, baseball laughs at people who think they know things). He’s walking a bunch of hitters, getting lucky when players wet-fart their bat on the ball as those are turned into outs at a historic pace (rather than dropping for hits), and his track record shows that eventually those are more likely to turn into home runs. Atlanta also doesn’t necessarily need him for the season. Mike Minor and Gavin Floyd are both making rehab starts and should be rejoining the team soon. They throw actual pitches rather than doinkballs, so they should each be able to supplant Harang in the rotation, assuming he doesn’t keep flirting with no-hitters forever. As for the game itself, it turned out worrying about preserving a 1-0 lead was unnecessary, since the offense soon jumped in with some extra support and the Braves wound up winning 6-0. Even without that knowledge, though, the Braves were playing the Mets. Even if Harang started pitching underhanded and blindfolded, the Mets probably would have found a way to screw everything up and lose. And it’s one game of 162. Look, every game is important, and the playoff participants are often separated from the shmucks staying at home by a single game and all that, but it’s less than one percent of the season. This game is already forgotten. But a no-hitter is forever. The last Braves no-hitter was in 1994, pitched by Kent Mercker. You know how I know that? Because it was a no-hitter! If you have a chance to go for history, you go for it. Health and standings be damned. I guess Harang just has to go out there and do it again his next time out. This time, I hope they let him try to go the distance. This entry was posted in Baseball, Sports and tagged Aaron Harang, Atlanta Braves, Braves, doof, Mets, New York Mets, no hitter. Bookmark the permalink.